Is it so wrong that I want to stuff you in my mouth? To begin, turkey has somehow become the big brother of Thanksgiving feasts (ham is the little brother). I’m sure there’s a very good folk tale/reason why turkeys have taken the head spot despite having no head, but I don’t really feel like looking into it. 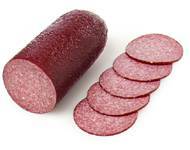 If there could be a middle brother, though, allow me to suggest this – hard salami. Even though it thinks it’s hard, it’ s really easy. I don’t know what they put in it, and I don’t want to know. It keeps it mysterious. It’s great with mozzarella on a plain bagel. Trust me. I bet it would be Jack Bauer’s favorite food. Rachel Bilson... hard salami...too easy. Don’t know what it is about Maria Bamford, but after watching this, I was wiping tears from my eyes. It wasn’t that I was laughing too hard… it was because I was crying. Click here to see the must-see clip, whether you like the clip above or not. Thisssss – I command!